Thee Melbourne AA Steps Weekend is an annual Alcoholics Anonymous event held in Melbourne Australia. The event ran was held for 5 years between 2005 and 2009 hosted by Alcoholics Anonymous a committee from AA steps groups. In 2015 it was revived by the Working With Others AA Group in Heidelberg. 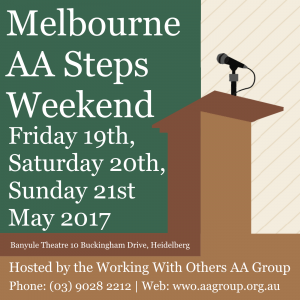 The next Melbourne AA Steps Weekend is on in May 2017. See the new Steps Weekend website for further details.